Lean people with a high body fat content have a higher risk of developing metabolic diseases like diabetes. You can now have your body fat measured as quickly as under a minute, using a device at the clinic, gym or at home. This device, which looks like a weighing scale, taps on bioelectrical impedance analysis (BIA), like the machines used in hospitals. Stand barefoot on the metallic plates of a scale and a few numbers will pop up on a screen, including the volume and percentage of fat that fills your body. It is fast, easy and painless. A diagnosis of obesity that is due to increased body fat can lead to prompt investigations for problems such as high blood pressure or blood sugar levels, he said. Obesity raises a person’s risk of chronic diseases, including hypertension, type 2 diabetes and heart disease. Dr Koh said studies have shown that health risks rise with an increase in body fat, especially visceral (organ) fat. Visceral fat – the fat surrounding the liver and other abdominal organs – is of particular concern because it is biologically active. According to the Harvard T.H. Chan School of Public Health, visceral fat releases fatty acids, inflammatory agents and hormones that lead to higher levels of low-density lipoprotein (LDL) or “bad” cholesterol, triglycerides, blood glucose and blood pressure. Dr Asim Shabbir, the director and senior consultant at the National University Hospital’s (NUH) Centre for Obesity Management and Surgery, said our bodies are made up of muscle, bone, fat and water. But the ratio of fat to muscle and the sites of deposition of fat differ from person to person. A person with a normal weight can have a high percentage of fat mass and a low amount of muscle mass, which results in the term “skinny fat”, he said. This is also known as normal weight obesity. The centre has seen people with a healthy weight but who have metabolic diseases like diabetes, hypertension and hyperlipidemia, he added. Data on the number of people here who are “skinny fat” is not available, but the figure could be higher than expected. Dr Koh said: “I see patients with normal weight obesity daily. It is first suspected when I notice that they have a prominent waistline. Dr Ganguly agreed that “there are indeed many people in Singapore who look lean but they are viscerally obese”. This means that although they look lean, they have a high body fat content. They are known as metabolically obese but normal weight (MONW) individuals. Though they have a normal body mass index (BMI), they are predisposed posed to metabolic complications. Dr Goh said the Duke-NUS Medical School and SGH jointly analysed the relationship between diabetes, BMI and NAFLD cirrhosis-related deaths in a study published in Liver International in February. It was based on the Singapore Chinese Health Study, which covered more than 60,000 people in Singapore. Until now, BMI is used to classify people as overweight or obese, though body fat can also be hidden, without causing a high BMI. BMI does not directly assess body fat, so a muscular person can have a high BMI but not a lot of fat. Experts said the danger is that “skinny fat” individuals may presume they are healthy because they do not have a high BMI. Dr Shabbir said BMI is a simple annotation of the percentage of fat in a person’s body, but without detailing its location. It is why “simple techniques like measuring the skinfold and waist circumference should not be rejected because they may appear unsophisticated”, he added. “They are simple, easy and quick to do, and also a highly informative assessment of fatness.” The more common method is to use BIA to calculate body composition. This is a convenient way, but it has limitations. For example, the amount of water mass in tissues can skew the readings. According to the American College of Sports Medicine, a body fat range of 10 to 22 per cent for men and 20 to 32 per cent for women is considered satisfactory for good health. People with BMI scores above 23 and a generous waistline – more than 40 inches (102cm) for men, and 35 inches (88cm) for women – are more likely to have elevated levels of body fat, said Dr Koh. Dr Ganguly advises normal-BMI people with a high body fat percentage or a family history of cardio-metabolic disease to measure their waist circumference. They should have their body fat measured and they should also go for blood tests to check for type 2 diabetes, hyperlipidemia or fatty liver, she added. Dr Shabbir said that people with more visceral fat have a higher risk of developing metabolic diseases, but this is not the only aberration. Factors like genetics, environment, stress and eating behaviour can be modified easily to help alter disease processes, he added. This is a very common method to measure fat in clinical or casual settings. You input your gender, height and age and let the machine do the magic. There are scales which look and work like a weighing scale, hand- held devices and one that incorporates both. They work by sending an imperceptible electrical current through the body – usually the hands and feet. “This electrical signal passes quickly through water that is present in hydrated muscle tissue but meets resistance when it hits fat tissue,” said Dr Derek Koh, head of Thomson Lifestyle Centre. 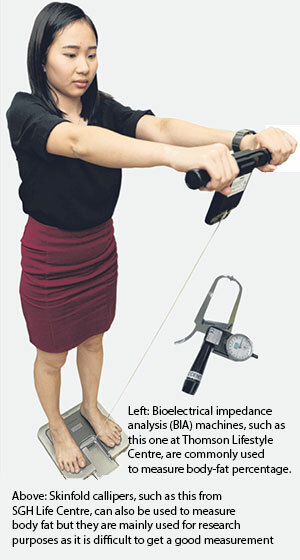 BIA devices use at least one electric current set at a specific frequency to measure body composition, he said. Multiple currents set at different frequencies have been found to be more accurate. Whether a person is hydrated or not affects the accuracy of the test. “Dehydration causes an increase in the body’s electrical resistance and thus an overestimation of body fat. Over-hydration can cause an underestimation,” said Dr Koh. Dr Cindy Ng, principal physiotherapist at Singapore General Hospital, said the variation of readings could be as much as 10 per cent of one’s body fat percentage. The amount of food eaten may also affect the readings due to the fluids present in food, she said. To get an accurate reading, fast for four to six hours before the test. During this time, you can take a few sips of water, said Dr Ng. To minimise errors, you should avoid alcohol consumption eight hours before the test and also avoid vigorous exercise four hours prior to the test, she added. Done with callipers, these may look simple but are dependent on the skills of the tester, said Dr Ng. It is mainly used for research purposes as it is hard to get a good measurement. She said various body sites are measured. The four common areas are the biceps, triceps, subscapularis (bottom end of the shoulder blade) and above the hip bone. Up to three readings are taken at a site, from which an average will be used. It takes a while to master the skill of using a calliper. For instance, it is easy to grip some muscle with the fat, when you are supposed to grip just the fat, she said. The number of sites where the measurements are taken and the equation used to calculate body fat also affect the results, she said. A person is weighed normally in a dry environment as well as when he is completely submerged in water. The difference in the readings is used to assess the level of body fat. Bones and muscles are denser than water, while fat tissue is more buoyant. Someone with a large amount of body fat will weigh much less underwater. Though the measurements are very accurate, this method is inconvenient and time-consuming, and thus done mainly for research, experts said. Dexa, which stands for dual- energy X-ray absorptiometry, reveals how much of a person’s body weight is made up of fat, bone or lean tissue. Magnetic resonance imaging (MRI) scans can also be used to measure body fat. These tests are very accurate but expensive and thus used in the study of diseases or clinical research, said Dr Asim Shabbir, the director of the National University Hospital’s Centre for Obesity Management and Surgery.